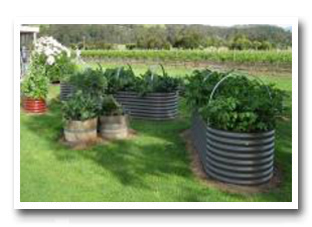 Ideal for growing Herbs, Tomatoes, Lettuce, Capsicums, Spinach, Silverbeet, Potatoes, Zucchinis, Strawberries and much much more! Colorbond© Colours - Classic Cream, Paperbark, Pale Eucalypt, Wilderness, Manor Red, Surfmist, Windspray, Woodland Grey, Cottage Green, Deep Ocean & ColorbondÂ© Colours. 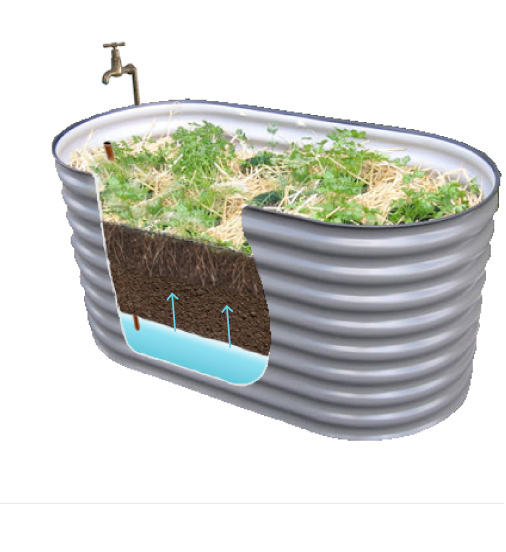 Our patented new Self Watering system delivers water and nutrients directly to your plants where they need it most - at the roots! It means reduced water evaporation, less leaf burn and healthier plants. This low and narrow 600mm wide Tomato planter is ideal for placement against a wall or fence - grow your favourite large round or cherry tomatoes at the back of the planter and still have room to grow companion herbs and/or salads at the front. 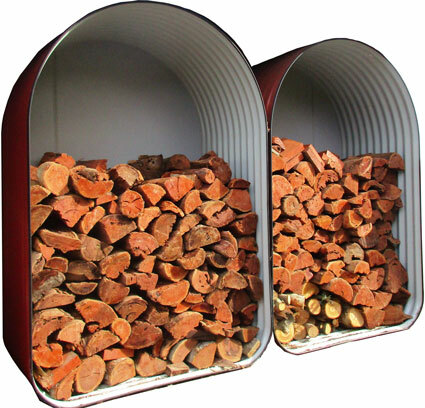 Available in colours Woodland Grey, Pale Eucalypt and Manor Red (pictured). The Veggie Garden has been manufacturing quality, innovative raised garden beds since 2007! We are located on the west side of Melboure, close to Ballarat and service a wide area including Ballarat, Geelong, Melbourne and surrounding areas. Our popular raised garden beds are just great for people with limited space but still want the convenience of growing their own fresh herbs and vegetables for the family. 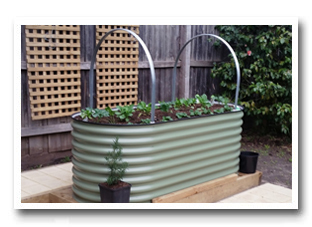 Veggie garden beds are fun and educational for the kids and they also keep your garden up and out of the reach of family pets, unwelcome pests such as rabbits and when fitted with the plant cover system also protects against birds, possums and even roos! 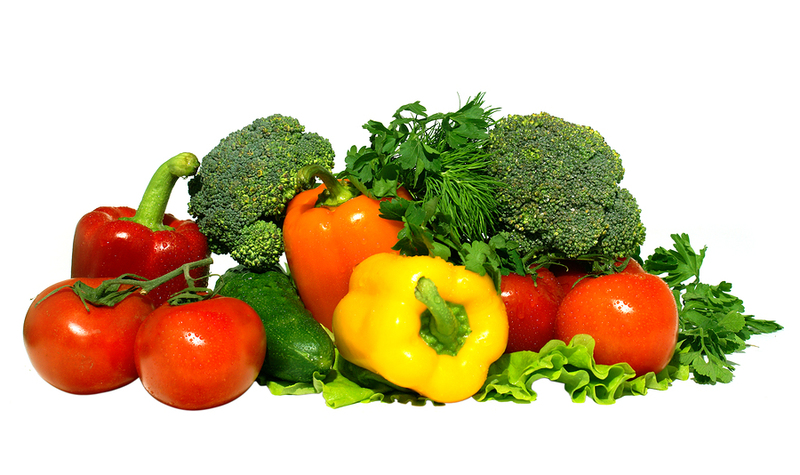 No more harmful horticultural chemicals when you grow your own vegetables - healthy and organically grown all the time! With our raised garden beds there is no more bending over! They are made in 3 different heights - 400mm (16″), 660mm (24″) and 840mm (32″). All our raised garden beds have a heavy duty PVC protector strip on the top edge which will not weather perish like other rubber strips, so there are no unpleasant sharp edges to worry about. Our new protective plant covers are a real bonus! 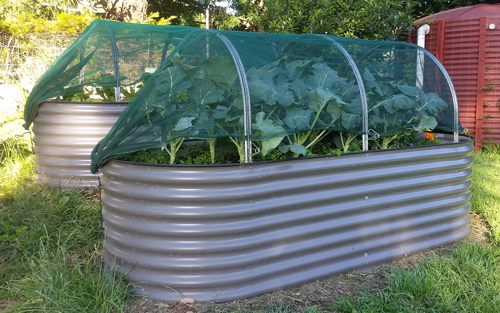 In the summer they protect against the fierce burning sun which can quickly destroy most leafy vegetable plants, and in the winter you have a mini green house to take your veggies right through the cold winter. 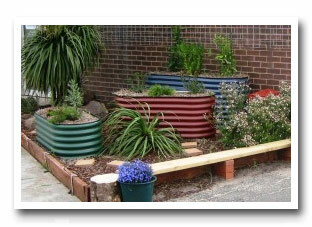 Construction of the raised garden beds is of heavy grade Bluescope corrugated steel available in many Colorbond© colours. The most popular colours are natural green colours such as Pale Eucalypt or Woodland Grey. Many different sizes are also available to suit any space Our raised garden beds are made to a standard not a price! 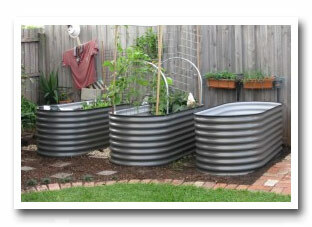 Our quality raised garden beds are solid construction with a double fastened joint. 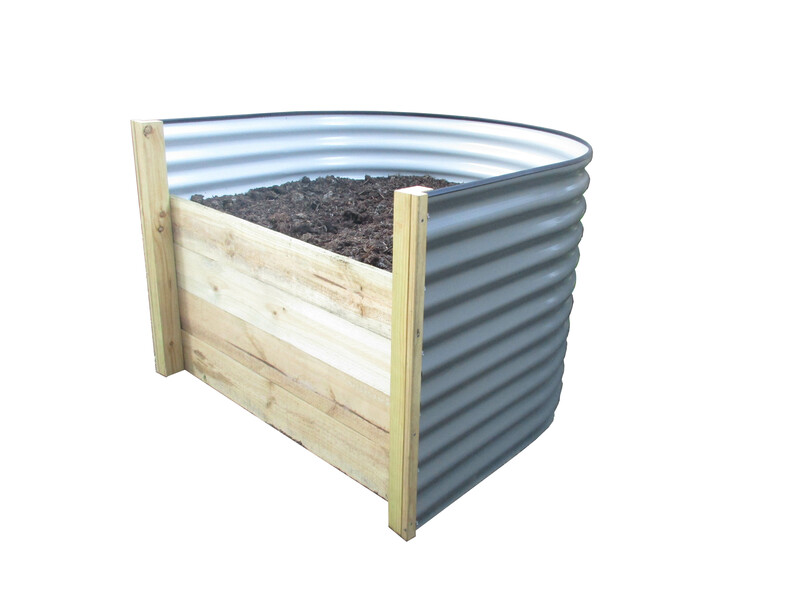 All our longer oblong raised garden beds are fitted with stainless steel support bars to prevent side bulging as occurs with other unsupported kitset raised garden beds. The Veggie Garden raised garden beds are just great for the whole family and are the way of the future - energy efficient, water efficient, convenient, healthy and money saving! They are ideal for growing a wide variety of fresh herbs, salad vegetables, asian leafy vegetables, tomatoes and much much more - and all just seconds away from your kitchen! Great for yourself or as a gift idea for a friend or relative.